This seminar will take place this year on Thursday, 20th September 2018 at the Village Hotel in Bournemouth from 7 - 8:30pm. 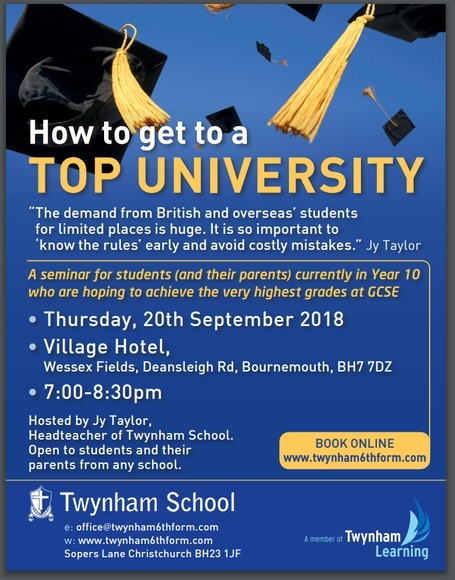 It will be hosted by the Headteacher of Twynham School, Mr Jy Taylor, and is open to students and parents from any school. The purpose of the seminar is to enable students and parents to be in an informed position when it comes to applying for courses at top universities in the future. Knowing the rules now could make all the difference when the time comes to apply, and many students rule themselves out of these universities simply by making poor decisions in Years 10 and 11. Teachers of Year 10 and 11 would also be most welcome, as would Heads of Year 10 and Careers staff from any school. There will be a welcome drink on arrival. The event is free, but please book a place using the form below. Please note that booking for this event has now been closed.